Freelance designer Russell Shaw created the book cover, branding, and video series for Jeff Shinbarger’s More Or Less book on generosity released by David C Cook publishers. About the Book: In More Or Less, Jeff invites readers to create their own social experiments to answer the question "What is enough?" while sharing practical stories and numerous actionable ideas that can be implemented into our lives today. Learn to make small changes now that will change others forever. Generosity is a chance to experience freedom in a world obsessed with gaining more. More Or Less is available wherever books are sold. About The Project: An identity mark was created for the book, as well as the parent organization that Jeff leads (Suffered Enough; the logo for the 501c3 was originally designed several years before the release of the book). I also created the cover design for the book, and worked as the director for a series of branded content videos that share stories from the book. These stories were also cut together to form the book's trailers, and all videos were provided to the marketing team to be used as promotional content marketing and as content for the author's speaking engagements. All video stories adapted from the book written by Jeff Shinabarger. Music by: “Deliver Us” by Daniel Bashta. Used with permission. Music by: David Leonard and Leslie Jordan of All Sons & Daughters. Used with permission. Music by: Bellarive: "I Know You", musical composition administered by: The Harry Fox Agency, Inc. (HFA) License obtained by David C Cook from EMI, License No. 537831 (on file with David C Cook). Music by: "Begin Again," provided by Micah Dalton. Used with permission. Music by: "Aperture" by Sleeping At Last. Used with permission. Music by: "Heart Beat" by Johnnyswim. Used with permission. 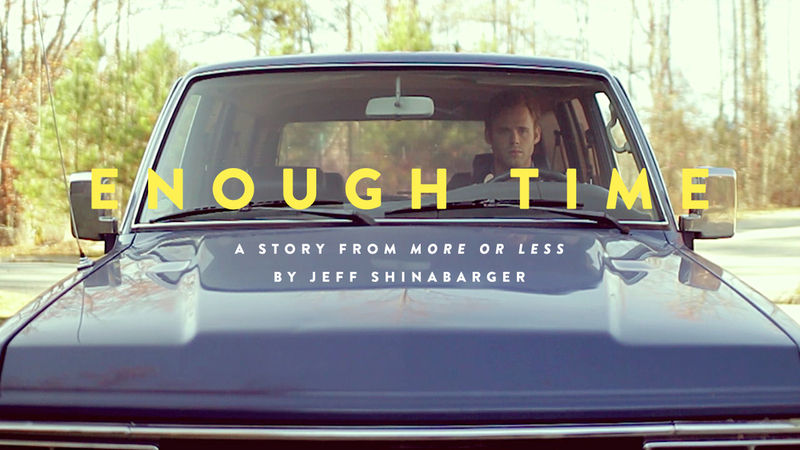 Shot on a Canon 7D, with Sigma 30mm f/1.4 and Tokina 11-16mm f/2.8, on location in Atlanta and Villa Rica, GA.
After the "Enough Time" story was picked up by viral site Unworthy, it received large numbers of shares and views. At the time of this writing, the video story has been viewed almost 50,000 times. Three additional video stories were also shot and produced. The full More Or Less Stories series is available to watch on David C Cook's YouTube Channel. "How much is enough? In this important and engaging new book, Jeff makes it clear that when it comes to generosity, connection and community, too much isn't enough." "It's a gully washer of love, creativity, and engagement that a parched world desperately needs." "In a society that values abundance, Jeff prompts essential questions that make us aware of what we lose as we gain. Jeff's stories and insights teach us that living a rich life is less about what we own and more about what we do and how we connect with those around us." 2014 Silver ADDY (Atlanta Advertising Club). Digital Advertising Campaign, Branded Video Content. 2014 The Communicator Awards Silver Award of Distinction in Branded Content: Promotional/Branding.